When someone has that ride where circumstances conspire to create as much suffering as possible, that rider tends to describe the ride as "epic." Well, I had an epic ride on Saturday and I'm still eating! I signed up to participate in the Palmetto Peloton Project's Pleasant Ridge Rider's Challenge. It was planned as a 100 mile plus ride. This would be perfect to help me meet my challenge of finishing a century each month March to August. The the route had to be changed do the ride would not conflict with the Assault on the Carolinas. The planners didn't want the P3 riders to end up in Brevard! So, the ride was changed to a 70 miler. I figured that shouldn't be a problem. I'd just do the scheduled route and then tack on the other 30 miles at the end. 100 miles... not a problem. What I didn't count on was the route being reconfigured to make that 70 miles pretty tough. Had it not been the end of March, I would have not decided to go on with those extra miles. No matter what happened in the official ride, I was going to have to ride those last miles. Right as we lined up it began to rain. Before we got out of the park I was already starting to get wet. Thankfully, I had my windbreaker on. It really was not so bad. This first part of the ride took us along River Road and then basically along the normal Bakery Run up through the watershed. The group rode along together chatting and loosening up the legs. As we neared Flat Rock, the group broke up and about eight riders went off the front. For the rest of the ride these were the riders I was in contact with. It was a pretty good group. On the climbs we would stay together, but on the downhills we would separate as some of the riders were not as comfortable with descending on the wet roads. By the time we reached Saluda, I was in a group of three riders. We made our first stop at Holbert Cove Road. About six of us connected at that point before one rider left on his own. Two other riders and myself left after him perhaps two minutes later. While I was feeling good at this point, I was told that the next ten miles or so were going to be tough. This would take us to Green River Cove Road. This would be a 5 mile climb up a 10% grade. I wondered how bad it could be... then I found out. I wasn't pushing it at all, but I was putting distance between myself and the other two riders. I think they may have known something I didn't know! Then before I knew it I saw some paint on the pavement "10% next 5 miles." I shifted to my easiest gear and decided regardless of what the other riders did, I was going to take my time. My goal was 30 miles longer than theirs. I knew if I pushed it now, I would pay for it later. This road was incredible. It was just one switchback after another. As you continued to climb up you could look over the edge and see three or four stretches of the road. You continued to climb up straight sections and then you would kick up hard for 10 feet or so as you made the turn to your left or right to start climbing the next straight section. Finally, I reached the point where I started to ask myself, "How many more of these am I going to have to do?" Then I looked over the edge and saw the other riders begin to catch me on the lower switchbacks. Then they caught me. Actually, before we reached the top, I was caught be four or five riders. I was proud of myself for not trying to chase them down. If this was the worst the route was going to throw at me, I was sure I could make it for the 100 miles. The question was, would it get any better or would it be worse? My thought was it was going to get better. Certainly we would soon begin to head down Hwy 25 back through the watershed. Unfortunately, I was wrong. I had set myself up for disappointment. As I was enjoying a downhill Hwy. 176, I nearly passed my turn onto Pearson Falls Rd. Thankfully, one of the awesome volunteers was there to get my attention and point me to the proper route. My trouble didn't end there because as I started on the road, my Garmin 305 started freaking out on me. Every time I pressed the mode button the device would go dead. At that point, I missed the turn onto Fork Creek Road. I continued down Pearson and suddenly the road ended in a gravel road. Okay, so this isn't right. I turned around and figured at worse I would have to go back to 176 and ask for directions. Before I got there, I saw Fork Creek Road off to my right. I took it. I knew it was only about six or seven miles before I could head home on Hwy. 25. However, while I felt good about my time on Green River, I was starting to wane here fifty some miles in. This stretch killed my time. I hoped Mine Mountain Road and Mountain Page Road would be better. Still, it never seemed to get better. All of this climbing was starting to take a toll. Finally! I made it to the portion of Mountain Page Road that would lead me to the watershed downhill. When I got to the end of it, I stopped to put on my rain gear again before the descent. From there to River Road it was time to regroup. On River Road I wondered why it seemed longer on the way back than it did leaving! A lone rider was ahead of me and I just set my sights on catching him. Just before Hwy. 11 I caught him and we rode in together talking as we went. He was from Rochester, New York and he had a lot of good things to say about Greenville and the Upstate. That made me feel pretty good. Just wish we could have given him a little better weather. As we made the final climb into the park, I kept playing with my Garmin to see if I could get some sort of read on the distance I had. I figured my wrong turn had added some miles. Best I could tell, I was at 72 miles when I turned around and headed back out of the park. I won't bore you with too much about this portion. I was pretty bored myself. My plan was to head out from the park 14 miles then turn around and come back. That would put me at 100 miles. I turned off of Hwy. 11 onto Hart Cut Road. On one particular shallow climb I got chased by several dogs. It helped my speed for a few yards, but by the time I slowed down, I was lightheaded! Hart Cut wasn't long enough. I turned around and then turned onto Parnell Bridge Road. That took me up to Talley Bridge and the Bates Crossing. I road up Bates Crossing until I hit Hwy. 25 near Hwy. 414. I turned around and rode back to Hart Cut. I recalculated and realized that I still didn't have enough. Now my left leg started to threaten cramping. I was scraffing PowerBars and sports beans. I was nearing the end of my water. I found if I just relaxed and spun I could work the cramp out. This continued as I tried to get in those last miles. I made another turn off of Hart Cut onto Goodwin Bridge and rode almost to Bates Crossing again. Then I turned around knowing that I was heading in for the last time. Wow, that last 8 miles was a bear. I wasn't looking forward to that last climb back into the park. The parking lot was nearly empty of cars. I didn't see any people. I rode straight to the bathrooms. As I approached the shed I saw the volunteers putting away all the stuff. I pulled up and asked if they had any lunches left. I was ready to eat a cow! Well, March's century is out of the way. My plan now is to do charity rides in April and May. Most of these rides do not go 100 miles. I'll have to stretch them out like I did this one. June, of course, will be the Assault on Mount Mitchell. I'll worry about July and August after that! Here is a map of tomorrow's ride. I will be reporting on it Saturday or Sunday on the GreenvilleOnline.com Cycling Blog. I was looking forward to riding tonight with some friends. Of course, the ride was centered around Paris Mountain. We rolled out around 6 PM. I got some ribbing for taking the win in the B group. I think I'm going to have to do the A group this next Tuesday. I guess I need to be put in my place. Before it seemed like I was ready, we turned up Altamont. I started off right with Billy and John. We were averaging around 10 to 11 mph. We were all there together until we reached the water tower. At that point the pace of those around me slowed and I kept the earlier pace. I didn't look behind me until I passed the halfway point. As I passed the sign I use as my marker, I saw 5 minutes and 57 seconds. I realized I was stuck. I had a very good time halfway but I knew I wasn't going to be able to maintain that. It was time to do a better job pacing myself. Looking back I had a pretty big gap to the next rider. As I continued up I held my 11 mph average until I reached the blue electrical box. This was better than the last time I did this climb. Ugggh, I was slowing. I looked back again... there was Art. Just before we reached the wall, Art went around me. He just started doing what I have seen him do time and time again. He steadily attacked the road. I tried to follow, but I couldn't gain. I crossed the line in 12 minutes 51 seconds. As I caught up to Art as we cooled down he said, "Thanks for helping me get that PR." Turns out he did the climb 10 seconds faster for a time of 12 minutes 41 seconds. Coming down the other side was lots of fun. We took several spurs off from the main road. Audubon (or however they spell it) was a nice change and then another road that had some pretty drastic switchbacks. Billy and I left the group on this section. That turned out to be a mistake. As we rode by the turn off on Woodhaven, I joking said to Billy, "Hey, we should do Woodhaven." We rode past it. Then I heard Billy say, "They are doing it!" I looked back and sure enough, I saw the helmets heading up the steep road. John came by us and just kept going. No way was he going to do that! Billy struggled to get out of his big ring. I was able to get set and headed up after them. Turns out Billy turned around and followed John. I was chasing down Art (who by this way was gone), Mike, and Louis. What a workout! I think I'll sleep well tonight. I arrived late for the Tuesday Night World Championships at Donaldson Center. That answered the question for as to which ride I would do. The A group was tempting but they had already started down the road and a couple of my riding buddies egged me on to chase it down and leave the B group. 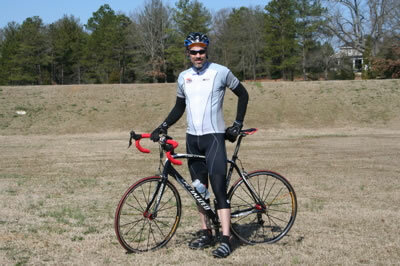 However, one of the reasons for going was to ride with my new team: the Greenville Spinners Bicycling Team. I hadn't gotten word which group they were going to join, but looking around at the jerseys it appeared that the majority of them were there in the B group. Before I had a chance to introduce myself, we were off. I felt kind of odd as I rode by a couple of the Spinners guys and they didn't say anything. I'm kind of a shy person and normally wait to be spoken to before speaking. Then I came across Kirk, a friend from past rides who was also decked out as a Spinner. I immediately felt more comfortable. I went to the front expecting a higher pace. Before I knew it, I was off the front. I was up around 20 mph and realized the group was behind me. I let off and moved over to wait for them to bring me in. No use killing myself this early! Once back in the group I started looking for Spinners. I believe there were about 8 of us and we started to control the group. First one teammate would go off the front and other teams and unattached riders would start to bridge. The other teammates would control the break and before you knew it we would be back together again. Then another Spinner or two would go off the front... etc., etc. until the third lap. The second lap was the fastest between the three, but strategy started to enter into the picture on lap three. Kirk and his brother Brian went off the front and the rest of team settled in to slow the pack. I think I made a mistake here by seeking to catch up with Kirk - Brian wasn't wearing a Spinners kit and I thought we needed to bring him back. Randy, who I believe is the team captain, pulled up to me to let me know Brian was our man and that we didn't need to chase. I backed off at that point. Unfortunately, a rider went to catch him. Another rider went by. It was Web. I told Randy not to worry about Web because he certainly couldn't maintain that speed for a lap and a half. I don't think he heard me because he rode up on Web's wheel to neutralize his move. This, of course, brought everyone else along and before we got well into the fourth lap, Brian was swallowed up. Now the mass was once again setting up for the final push. Randy started to spread the word through the Spinners that we were going to do a lead out. This is where a team will form a line and each rider in the front sacrifices by giving everything to help the last rider get across the line to win. He said we should be set up for the attack by the new pavement. Two thoughts crossed my mind... 1) where was the new pavement, and 2) who were we leading out? I finally decided if I stayed with Randy things would begin to develop and I would not make a fool of myself when the time came to do my part. So, as he began to move his way toward the front of the group, I did as well. Once we reached the railroad tracks, Randy really picked up the pace. I stayed on his wheel assuming there where Spinners behind us ready to lead the chosen one to victory. As we crested the rise after the tracks that would lead us into the decent before the final climb, I sneaked a look behind me. There was a dark kit. Nothing else. Okay, so we were in a breakaway of three riders. Randy moved over a bit and as I went by he said, "Pick it up a notch." So I tucked to avoid the wind and tried to pedal in nice smooth circles - giving about 70 percent effort. We were hitting about 25 mph before cresting the hill. On the way down we lost our form as I heard Randy speaking to the black kitted rider behind us. Turns out it was a Hincapie rider and somehow it came up that it was her birthday. Randy told her we would give her the win if she would pull to the finish. She passed on that, but it put us in a lull as we waited for her decision. Finally, Randy told her to hop on and we went. I figured at this point I had the green light to let it go. I put out of my mind anything happening behind me and started up the hill. I was climbing at about 26 mph. I was feeling really good. Before I reached the fire station, I looked back. There was no one there. I don't know what happened to Randy and the Hincapie rider. They were probably there but I couldn't pick them out from among several riders of another group we had overtaken. I slowed and started glancing back. Finally I saw the main group coming over the rise just as I passed the start/finish line. Wow. I was surprised. Turns out the team worked in my favor. Randy had given me a great lead out and Kirk and the other guys were making the group mad as they disrupted the finishing pace. Randy got me the lead and the other guys helped me extend it. Last night I went over Paris Mountain. I told myself that I wasn't going to push it coming back up the Furman side. Of course, I did. The worse thing about the climb was the wind. In certain sections of the climb, I was protected and then I would turn a curve and wham I was hit in the face with a headwind. By the time I got to the wall, I was crawling. I did average 10 mph for the first 3/5 of the climb. I felt kind of good about that. It is that last section beginning with a yellow fire hydrant a little ways before the wall. This is the point where I start to bog down. From that point to the top I dropped to 9.5 mph average. Tonight I am off to Donaldson Center. It should be a little warmer - around 60 degrees (it was 42 degrees during my evening ride) - but the wind could be gusting up to 20 mph. That is the thing about spring; it gets warmer, but it is also kite flying weather. I'm a little nervous. It will be the first time I enter a group ride as part of a team. I have not idea what to expect. Does that mean that we will hook up in the ride and help each other? Does it mean we will all just show up looking alike but not take advantage of it. Probably a lot depends on me and my willingness to introduce myself, etc. The Greenville News is launching their new GreenvilleOnline.com site sometime today (March 24). You'll notice that my cycling blog has disappeared from the front page. It won't automatically go there when I post an entry. That is why I need your help. Before the site goes live, you can find my blog here: beta.greenvilleonline.com Once it goes live, you should be able to go to the old URL, click on the sports section, and then scroll down until you see my blog entries. Please swing by and give it a read. When you are there, be sure you click on the "recommended" link at the bottom of the blog. 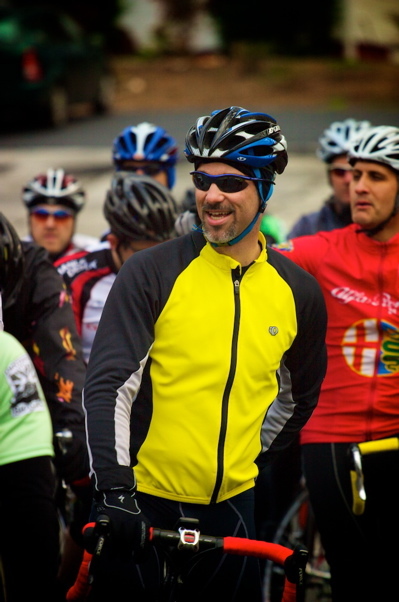 I've enjoyed sharing my view of the Upstate cycling community in this space on GreenvilleOnline.com. The placement I had on the front page really helped give the blog some exposure and I'm afraid with all the changes I may lose out. There isn't much reason to post there if people aren't reading it. People won't be able to read it if it is hard to find. Thanks for helping me out. Tell a friend as well. I want cycling to be represented on the site. Hopefully, you feel the same way. This morning I headed over early to meet with Jim Cunningham for a physiological test and bike fit. You can read about the experience over at the GreenvilleOnline.com blog (published at 8 AM 3/14). I mention it here because it pretty much wore me out... or so I thought. Heading over to ride over Paris Mountain with some friends, I was apprehensive. With the effort I put in this morning, I figured I would be toast. A personal best up the mountain seemed out of the question. It was good to connect with some riding buddies I hadn't ridden with in awhile. There was Art! Regardless of how I ended up feeling physically, I knew it was going to be a good ride. As we neared the base of the mountain we went through a neighborhood with a nice little climb. Ooooo, I could feel the muscles tighten and now I was really wondering what was going to happen. Before long we were ready to turn up the mountain. As we were nearing the turn, I said to Art and another rider near, "All we have to do is maintain the current speed and we'll break 12 minutes" -- we were spinning along at 11 mph. Then we turned up to start. It was good for me to start up with a group. It kept me from starting off too fast. By the time we reached the water tower, I was surprised at how I felt. It was tempting to push it a little more. However, I noticed I was riding along at about 10 mph and that seemed good for what I expected. When I reached the easy turn above the straight, I held back and just stayed under 12 mph. I figured I might end up going fast by going slow. We rolled across the half way point and I was still feeling strong. At this point, I started to watch my heart rate monitor. It read 178. From what I learned today in my test, I figured I needed to stay under 182 to save myself for the wall. I kept myself breathing and kept relaxing my shoulders. Art was there with me so I tried to feed off of his presence. Up ahead was Bob who had gone off the front before we started the climb. He had basically maintained the gap since the start. Bob helped because he gave me a goal to aim for. Then I noticed my heart rate had climbed to 184 bpm. That was the absolute highest I was going to go before the wall. I eased up to keep my speed as much as possible while staying under that threshold. Wow, the wall was hear and I didn't bonk in that last third like I normally do! I figured I might not get a personal best, but this wasn't going to be a bad climb. Now I just needed to go a few dozen yards. I shifted down two more rings and stood. I rocked my way up the climb. My heart rate was gliding along at 185 bpm. Then it was time to ease into the left turn that would take me up to the KOM. I pushed even harder and my heart rate shot up to 189 bpm. On the wall I was hitting a peak of 13 mph. Nice! I rolled across the line in 12.45. Bob, who was up ahead, finished in 12.44. So, he had maintained the gap from the very beginning. At this point, I didn't care. I was just glad to have finished only 6 seconds off of my personal best -- and I really wasn't working that hard. Go slow to go fast. The rest of the ride was fun because the pressure was off. It was literally all downhill from there. Even thought it was nice to do a good climb, it was even a better ride because of the beautiful weather and the company. I'll trade a good time for that any day. Tonight was the first night back to the regular Tuesday rides at Donaldson Center. I headed out for the fun after having an early dinner with my family. The area where everyone parks had a respectable number of cars... not as many as I remember from last year, but a good number for the first night back. This was a reminder to me that while I may have the fitness to ride with the big boys (at least the slower big boys), I have a lot to learn about bike control and cycling intelligence. Hey, I guess that is one reason why I do this, but sometimes learning can be embarrassing. Still there is only one way to learn and that is to do it. I knew I wouldn't be crossing the line first so I decided I would use the ride to gauge my fitness and, well, have some fun -- even if I did blow up doing it. If that was my goal, I succeeded! Here is how it unfolded. The first lap was fast. At least it seemed fast to a guy who has been riding Cat. 5 races. Honest, tonight's ride was harder than any of the Spring Training Series Cat. 5 races. The lap was fast but relatively uneventful. The group stayed pretty much together. Going into the second lap, which ended up being six seconds slower than the first one, I pushed more toward the front. I never pulled, but I did get hung out in the wind a bit, but for the most part I was dicing around in the pack. For a moment I actually got scared. I was in the middle of a pack and we were going in excess of 30 mph and I thought to myself, "What would happen if I crashed right now?" The answer was something I didn't want to think about, so I pushed it out of my mind. During the first lap and the beginning of the second I kind of hung out behind Rodney and John. I figured I could learn from them and also let them pull me along :-) Toward the middle of the second lap, I was riding in the top 10 or so of my group (some of the Pro 1/2 guys had already gone up the road). At the end of lap two I was starting to wane. I pulled over to the left to let the group pass me up. When John came by, he yelled, "Pedal, Pait, pedal!" I'll be honest, I needed that kick in the seat right then. I was at a point where I normally would have just given in. I just couldn't bear the thought of going into the shop and hearing John say, "There you go again, going up front and blowing up ON THE SECOND LAP!" I started spinning and set my goal to keep up with John. Of course, first I had to catch him. I finally did so a little while after the first right turn after the start finish line. Not sure if he was waiting to see if I was going to catch up, but I did notice him looking back a bit. For the rest of that third lap, I was a good boy. As a matter of fact, by the end of the lap I was feeling REALLY good. Uh oh, that means more foolishness ahead. First though, I have to publicly admit I was a numbskull. Actually, I was numbskull twice during the rest of the ride. This first instance happened when I was finishing the third lap. I was going along at a good speed, but trying not to over do it. We were overtaking riders and just as I was overtaking a rider to my right, a guy came blowing by me very close on my left. He didn't touch me, but he was close enough to startle me and I instinctively went away from him. Of course, the caused me to bump the rider to my right. I came off him quickly and apologized. That was the Cat. 5 coming out. Embarrassed, I quickly left him so I wouldn't have to feel worse every time I saw him. Then as we got to the point where I caught John earlier, Strad went off the front. I knew it was stupid, but I went with him. I really intended to do some pacing with him. When he moved over, I went forward. I looked back and Strad wasn't there. There were two Hincapie-Barkley riders where I thought he would be. One was Steve Baker and I'm not sure who the other one was. Where was Strad? I slowed and moved over a bit and the riders went past. Soon we were caught by the group. I settled in. Then as we passed Kitty Hawk, Strad went off again. I grinned to myself and went after him. No way would we make it, but I wondered how long we could hold them off. Strad never moved over and I didn't have the strength to go around him. The guy pulled me all the way past the rail road tracks. Now I was really done for. I moved over to the yellow line. Strad was able to get back in with the main group. This was when I did my second numbskull move of the night. I don't know what I was thinking, but I saw a gap and thought I could jump back in. However, at the speed I was going, it would have been impossible. For a split second my brain said go. I moved right. Thankfully, my brain actually started working and I realized that I couldn't make it. Of course, the guys coming up didn't know what was in my brain, so they let me know what they thought of my riding skills. I thought one of them was Rodney -- I think they were in Carolina Metro kits. I apologized afterwards, but Rodney said it wasn't him. Well, whoever you are, sorry about that! I was dropped off the back as everyone started to ascend that final incline. I finally recovered enough to pass some of the riders who were also dropping off and I finished not to far behind the main field. Really, I felt pretty good about it. Had I not done those two fliers during the final lap, I could have finished respectably. But man, those breakaways were fun! Maybe next time I'll ride less like a fool. I didn't finish everything, but I needed to get out and clear my brain. The beautiful redhead was out with Things 1, 2, and 3 doing some shopping. I headed home and pulled out my trusty Tarmac and headed for some laps of Cleveland Park. The idea wasn't to get a PR or even ride that hard. It was just to get out and do some sweating, work my muscles, and clear my mind. Ah the freedom of making those wheels spin. The bike did exactly what I wanted it to do... unlike the numbers I battled with last week and today! I didn't have to think of anything I didn't want to. If I didn't want to think at all, I could just listen to the gentle sound of the rubber of my tires rolling across the black tarmac. Peace. The several laps I did in the park were fun. One two of the laps I decided to just give an all out try between the monument and the yellow pedestrian sign by the tennis courts. I was rolling along at 33 mph in that section -- by myself. Finally, on the last lap I got in before going home, I got in behind another rider. We rode along the lower portion at about 20 mph. By the time we turned to start up the hill, I was feeling pretty peppy. Once we started the climb, I just took off. All the struggles of the day went to my legs and I rode them out hitting 26 mph on the climb. I maintained speeds over 20 mph until I started up Woodland Circle. From there I took it easy and just rode on home. I enjoy racing. I like the challenge of endurance rides. However, the ride I had tonight is why I ride. I mentioned that last week wasn't a great one for me. By Friday evening I was pretty bushed. I was down physically, mentally, and emotionally. Didn't get in a ride Friday -- not on the road or on the trainer. I almost called off going to the race. ...I decided to give it a go. If you want to read about the race, go on over to the GreenvilleOnline.com cycling blog. This is the story behind the story. It is more wild than the race! The day started with me over sleeping. Not by much, but I got a little bit of a late start. However, I had still budgeted in an hour to get to the race. Turns out that I needed it! I've been having some problems with my contacts and today they were really bothering me. I thought they would clear up and wouldn't be a problem. Yet as I got down the road I found they weren't any better. Needless to say, this made it hard to read the road signs and I missed the turn onto River Falls Road (my wife had the GPS in the car for coming up later). It was so frustrating fighting with my contacts and trying to see the signs. Turns out I had my contacts switched! I called the beautiful redhead and she was already leaving. She turned around so she would get on the Internet and give me directions. We started working me back to the the right location but my phone kept going in and out of service. Now I was fighting contacts, cell coverage, and the clock! I made it with about 30 minutes to spare. Thankfully, my brother-in-law was there (a neat surprise to have him there - he took some great pictures) and he helped me get my bike serviced and switch my number to the other side of my back. I met up with my cycling buddy Barry and we even had a few minutes to warm-up. Then we headed into the start area when the call was made. Amazingly, by this time I was feeling pretty relaxed. I was so glad that I made it that it made all the frustrations of the morning go away and I didn't think as all of the last week. I also had my first challenge of my "racing career." I had several people congratulating me -- by the way, my mother-in-law and father-in-law showed up as well along with the beautiful redhead and the Things (they drove up right before the start) -- on my third place finish. Then the finishes were posted. I wasn't on the list. So I went to find out what was up. It was kind of cool because I got to go up in the officials' wagon and see the way they do the scoring. It is basically a video camera and a recorder. They record the riders coming by and then go frame by frame to note their numbers. Well, when I came by, it was obvious why they got the wrong guy in third place. My number was moving because I was wearing a looser fitting cold weather jersey. It caused the number to bow up. My 573 really did look like a 613. They were very quick to make the adjustment and I got my little trophy. It took me back to my days in Little League when my team won the area championship. It really was great to have a little something nice happen for me. I mentioned that I have been pretty busy. Because of that -- and the wild weather yesterday -- I have not been able to ride the bike. With the race coming up on Saturday this was a concern for me. I rushed home after work and jumped on the bike. The idea was to do about a 20 mile ride with a good amount of pushing. I did the route the Sunshine guys were doing Thursday nights last season. The route takes you along the base of Paris Mountain and then over Altamont Road. I was moving along with a high cadence through the first portion of this. The idea was to push pretty hard and then do a moderate effort over the mountain. Just as I was coming up Buncombe to turn for the climb I caught a glimpse of a rider starting up. I picked up my pace to catch him. As I drew closer I noticed that it was actually three guys. The yellow kit I knew belonged to Strad. There was Rodney and another rider I did not know. Oh boy. If I was going up with them, it certainly wasn't going to be a moderate effort! I was already huffing and puffing from catching the guys. I had to recover fast if I hoped to stay with them. Rodney introduced me to Aaron and we started up. Now, Rodney is a Pro 1/2 rider. Strad is a Cat. 4 (though he has the points to be Cat. 3). Aaron, I'm guessing, was at least Cat. 4... perhaps Cat. 3. It was embarrassing. I was trying to get oxygen while those guys were just humming along carrying on casual conversation. They didn't seem to be affected at all. We passed halfway. I was with them. We got into the last two-fifths of the climb and I started to struggle. By the time we reached The Wall. I couldn't see them around the turn. Man that last stretch seemed to take forever. I crossed the line as the other riders were waiting for me. 13 minutes and 45 seconds was my time. I'm guessing they made it in under 13. They probably thought I was about to die. At least when I looked at them they were sweating! As we talked, I learned I had just caught them at the end of their repeats! That was their fourth time to climb the road. I have a way to go having that type of conditioning. The blog might take a hit this week. Just warning you! I have started a new position at the University. I'm no longer the Public Relations Manager. I'll be working with Alumni Relations. Yesterday was my first day. My nights are pretty full as well. It is going to be a struggle to even get some spinning in. My first opportunity to get on the road may end up being Thursday -- and that is the day I'm supposed to take off! Things are not looking good for River Falls. Still, a lot can happen between now and then. Perhaps an opportunity will present itself. After finishing somewhere around 13th last week, I was looking forward to getting out on the course at Fork Shoals and giving it another try. I learned somethings during that race and I wanted to put those lessons in action this Saturday. Number One: Get to the starting line on time! This week I warmed up by going backward on the course to check out the finishing stretch. I made sure I was back in plenty of time to get to the front. I lined up right behind the Cat 5 34- riders and so I was on the front row when my group came to the line. It was nice to get at least one of the lessons right. We were in a neutral zone until we made the first right turn. Though I started on the front row, I didn't want to stay there. Thankfully, after the turn several riders went around me and I started working to stay in the top ten. The new wheel set and Force components -- if nothing else -- made me feel more confident going into the ride, but the shifters were my undoing on the first lap. It happened soon after we turned onto Stockton Road. I was staying in the top ten and then a rider slowed in front of me. As soon as I eased up behind him several riders accelerated and formed a gap. I moved to cover it. The SRAM was awesome as I shifted from the small front ring to the 50. I moved around the slower riders and bridged the gap in no time. Then I hit my first problem. I went to shift back to the easier gears. When I shifted I jumped down to the easiest rear gear and the easiest front! Just like that I was pedaling along at 180 rpm. Needless to say, they moved away from me like I was standing still. By the time I got things corrected, I was dropped out the rear of the field! Don't panic, just get back on -- and don't try to do it too quickly. By the time we reached Hillside Church Road I was catching the rear of the field. Now it was time to work my way back toward the front. The good news is that I was feeling much more confident with my riding. I wouldn't say I was being aggressive, but I was owning my space. There were a couple of times it got dicey. Primarily when we started to climb. Some riders have a tendency to start weaving back and forth and in a tight group you have to time things just right to get past them. By Dunklin Bridge Road I was back with the top ten. Things were pretty uneventful from that point until we reached the start finish line. I was running seventh as we started the second lap. I'm sure I used some energy trying to get to that position, but for the most part I was feeling good. Had I stayed smart, who knows what might have happened. As it is, I think I made a fatal error in the second lap. Because of getting trapped in the pack on the field sprint last week, I wanted to make sure I was in position to 1) break away should the opportunity present itself or 2) be in a position to find a lane in a field sprint. Where I think I erred was getting it in my head that I needed to do this at the start of lap two! Several riders really picked up the pace and I moved to cover the acceleration. I stayed with these riders up through Cedar Falls Road. Right before we turned off of Dunklin Bridge Road onto Cedar Falls, the front accelerated again. I was there to cover, but so was a group of about 15 other riders. On Cedar Falls Road things went back and forth. I could tell people were regrouping for the final sprint. It might have been a good time to go, but I was doing the same thing! Looked like it was going to be another field sprint. As we started up Turner Road I got shuffled back a bit. This time I was on the right hand side. I saw Chris Chapman go flying by on the left and I knew things were starting! We were about 500 meters out at this point. There was a little window of room along the "white line" (on this road there actually aren't any lines) and I decided to jump through it. I stood and by the time we got 400 meters out, I was starting to pass on the right. Then with 300 meters to go, the window closed. Dale Earnhardt would have been proud. I didn't even let up. When the guy moved into my lane I just eased off into the grass and got around him. 200 meters to go and I was running in the top three! "I just might win this thing -- or at least place!" I thought to myself. At this point I should have gone down in my hooks and thrown my heart rate to the wind. Well, I didn't go down to the hooks, but I did try to give it my all. Then I started seeing riders move around me. I knew my legs weren't doing what they should. I hit a max speed of 27 mph in the sprint. My heart rate only hit 189, but my speed just dropped. I crossed the line at about 22 mph. I saw a guy coming up behind me on my left. I knew he had a chance to take me at the line, but I just couldn't seem to get the legs to turn the crank fast enough to hold him off. Right at the line he did me in -- by about the width of your tire and wheel rim. I was disappointed and I am still discouraged. I know I goofed by riding too hard during the early sections of the second lap. However, I don't think that would have made all the difference. It is my training that needs to step up. Unfortunately, I only have a week before the next race and there isn't much I can so in that amount of time.